First of all, there are many types of pancakes out there but this post only concerns american pancakes. No crepe pans, or scotch pancake griddles around here. I’ve been using the pancake recipe from the Joy of Cooking for some time now. The recipe is veganized by replacing the non vegan ingredients with their vegan counterparts. Besides the obvious, eggs are replaced with Ener-G egg replacer. I’ve been fairly happy with the results but it could definitely be better. About a month ago, Paul told me about a guy, Erik Pukinskis, who had spent a day testing a number of different recipes and blogged about the results. Paul made the ones that were determined to be “the best” and they were really good. Definitely better than the Joy of Cooking ones I had been making. I decided I wanted to make them too and checked out his blog. It seemed that the two key differences were the amount of baking powder and the method used to mix the fat into the batter. More baking soda = fluffier pancakes. Apparently it really is that simple, as long as you don’t add so much you can taste it. The usual method for mixing margarine into pancake batter is to melt the margarine and mix it in with the other liquids. It makes logical sense. However, Erik decided to try cutting/rubbing the solid margarine into the dry ingredients the same way you would make biscuit dough. I really think that this is a big factor in the final texture of the pancakes. To try and keep the number of variables low (yeah, I know 2 is already too many to draw any scientific conclusions) I decided to apply the previous two alterations to the JoC recipe. There are also a few things that I like about my usual recipe that I wasn’t so into about Erik’s. I like to use egg replacer instead of banana since the taste is neutral. I also don’t know whether I can believe that he “tried both soy and oat milk, and it didnâ€™t seem to matter. Water was just as tasty.” Really? Makes 5 six inch pancakes. Mix flour, sugar, baking powder and salt in a large bowl. Cut in earth balance until a crumb structure is formed. Whisk egg replacer and water using an electric whisk. Add wet ingredients to dry and mix with a whisk until relatively smooth. Erik should definitely take the credit for putting in all the America’s Test Kitchen-esque hard work . I think, if anything, my test serves to reinforce some of the techniques that Erik used in his recipe. These really are the best dairy-free, egg-free pancakes! My kids have multiple food allergies, so I’m always making substitutions to traditional recipes. The Joy of Cooking pancakes with substitutions were adequate, but not something I would eat for myself because they turned out too gummy. I made this recipe for dinner this evening and they turned out better than traditional non-substituted pancakes from Joy of Cooking! My husband couldn’t believe it. Because of food allergies, I used Spectrum Palm Shortening (and added about a teaspoon more) for Earth Balance, and I used half vanilla Hemp Dream hemp milk and half So Delicious vanilla coconut milk. For my husband and me, I added fresh blueberries, and for the kids I threw in a few Enjoy Life mini chocolate chips. This is definitely a recipe I will use forever and pass along to other food allergies sufferers. Thanks! 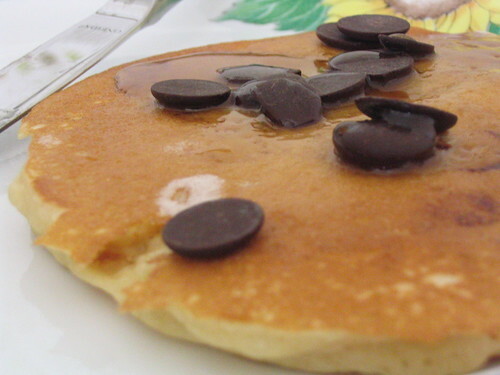 This is the best ever pancake recipe! We’ve had it so many times now! Thank you! I have never found a vegan pancake recipe that rivals the non-vegan pancake recipes that my dad and sister make. This is IT. YUM.